As you go through this list, you will also find references to labeling photos and videos. Consider doing more than that, and creating a timeline for your family – a digital or printed look back through your life, with photos and more included. This keepsake will be invaluable, and a way to create a lasting memory for future generations. For those who are grieving your absence, it will provide a reminder of the life you lived and the many connections and experiences you shared with them. Print this out and review it with your partner, spouse or family – it can be a useful tool for them as well, allowing you to understand their wishes too. Think about where/how you would like to die; in what surroundings; with what things (Music? Mementos? Photos? ); with which people present? Would you rather die at home? 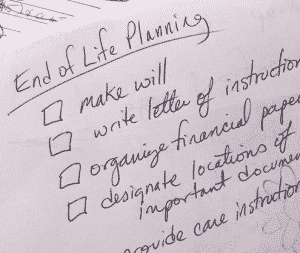 Is it acceptable that you die in a nursing home, hospital or dedicated hospice unit? If so, select the provider in advance. Who do I give my personal belongings to? If you’re married, most likely all of your belongings will transfer to your spouse or family. If you are single, then you must specify what you want done with these items. Who gets my special items, such as photos, mementos, etc.? Have I labeled and identified the people in my photos? Who do my photos (pictures, negatives, discs, etc.) go to? Have I set up a guardian for my children for the immediate time after my death? Have I clearly set made arrangements for short-term money for them? Have I set up the paperwork for where my children will go permanently? Have I made arrangements for the care of my pets? If I have children, have I left letters or videos to them? As mentioned before, creating a meaningful record of your life for your children or spouse can allow them to feel more connected to you after your death. It also provides a meaningful keepsake for future generations. Are all my digital photos/videos in one place? If on a computer, is the computer or are the files password protected? Have I provided that password to someone in the event of my death? How do I want my social media accounts handled (Facebook, Twitter, LinkedIn, etc.)? Have I made the passwords to those sites available to someone in the event of my death? Where do I want my body to be taken? Which funeral home/mortuary? Do I want to be embalmed? Buried? Cremated? What are my burial/casket preferences? Do I have burial plot? If cremated, where should my ashes be scattered or interned? Who do I want notified of my death? Do I have a complete, up-to-date list available – and does someone in my family or community know where to find that list? Do I want to write my own obituary? If not, whom? Do I want/need a headstone/grave marker? Have I written out what I want inscribed on it? Design? Do I want a formal funeral or memorial service? Program? Do I have special needs for my ceremony? Military? Religious? Who will deliver the eulogy? Ask him or her in advance. Do I want to identify a charity “in lieu of flowers”? Do I want a wake or memorial party instead of a funeral? Who needs to be made aware of my death? Make and maintain a contact list for your funeral or memorial notices. HealGrief disclaims and is not responsible or liable for the products, services and/or content of these sites and resources. HealGrief provides these links for your convenience but does not endorse the material on these sites and does not make any recommendation as to any product, service or other resource.